Can a team win an NBA title without a 20-point scorer? Which team would you guess has won the most NBA championships: A team that had no player average 20 points or more during the regular season, or a team that had two players average 20 or more points per game (ppg) in the regular season? Before we answer that question, let’s look at the six remaining teams in this year’s playoffs. The Thunder are in the Western Conference Final and will face the San Antonio Spurs. The Thunder feature the high-scoring twosome of Kevin Durant and Russell Westbrook. 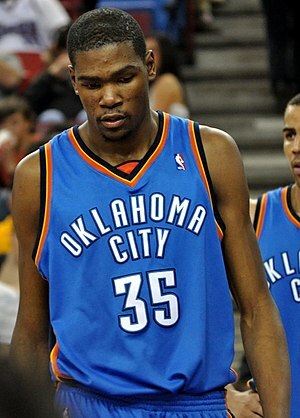 Durant led the league with 28 points per game while Westbrook was at 23.6 ppg. The Spurs, on the other hand, did not have a player with a 20 ppg for the season; Tony Parker led them in scoring with a 18.3 ppg. Of the four teams fighting for the two playoff berths in the Eastern Conference Final, Miami is the only team with two players who averaged 20+ ppg in the regular season, LeBron James (27.1) and Dwyane Wade (22.1). The other three teams did not have a single player with a 20 ppg for the season. Paul Pierce led Boston with 19.4 ppg; Danny Granger led Indiana with 18.7 ppg; and Lou Williams led eighth-seeded Philadelphia with 14.9 ppg. In the past 65 years of NBA playoffs, a team with no player who averaged 20 or more points during the regular season won 13 titles. Teams that had two players who averaged 20 or more points per game in the regular season won 18 titles. Here’s a look at the 13 teams that won titles with no player who averaged 20 ppg in the regular season. * Miami was the last team to play in the NBA Finals with two players who averaged 20+ ppg in the regular season: That was last season with Wade (26.7) and James (25.5). 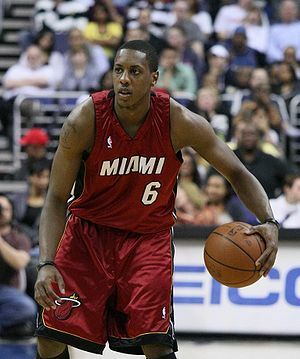 * The 2006 Miami Heat were the last team to win an NBA title with two players who averaged 20+ ppg in the regular season. Wade averaged 27.2 ppg and Shaquille O’Neal averaged 20.0 that season. * The last time two teams that had two players average 20+ ppg in the regular season faced off in the NBA Finals was in 1995 when Houston with Hakeem Olajuwon (27.8) and Clyde Drexler (21.4) defeated the Orlando Magic with Shaq (29.3) and Penny Hardaway (20.9). * The last time the NBA Finals featured two teams that did not have a 20+ ppg scorer was in 1978 when Washington defeated Seattle for the title. Leading scorers for the teams were Washington’s Hayes (19.7) and Seattle’s Gus Williams (18.1). Sports Stats ‘on Tapp’ is a biweekly blog that is published every Wednesday and Sunday with a bonus “SIX STATS…” posting every Friday. Oklahoma City Thunder teammates Kevin Durant and Russell Westbrook combined to score 57 points in the most recent NBA All-Star Game. That was the second-most points in an NBA All-Star Game history by teammates; the Miami duo of LeBron James and Dwyane Wade combined to score 60 points in that same game and now hold the record for most combined points by teammates in an NBA All-Star Game. The two pairs became the sixth and seventh teammates to score 50 or more points in an all-star game (see my blog of February 24, 2012 for more on this stat). Durant and Westbrook are looking to join James and Wade in another elite group. As of games through March 5, Durant is averaging 28.1 points per game and ranks second in scoring in the league. Westbrook is averaging 23.7 points per games and ranks fifth in the league. If Westbrook can bring his average up and over the 25 points per game mark by the end of the season, they would join 15 other sets of teammates to both average 25 or more points per game in a season. Following are the teammates who both averaged 25 or more points per games in an NBA season. Note #1: Of the 15 pairs listed, three played on title teams (Lakers 1971-72, 2000-01 and 2001-02). Three lost in the NBA finals… Lakers 1964-65; Celtics 1986-87; Heat 2010-11. Only two of the 15 did not make the playoffs that season… Royals 1960-61; Knicks 1961-62. Note #2: Of the 15 pairs listed, 11 played on teams that had a regular season record better than .500.